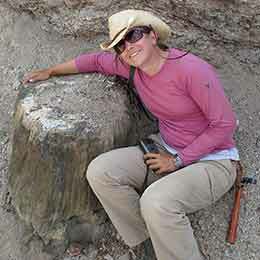 Ellen Currano, a UW assistant professor with a joint appointment in the Department of Botany and the Department of Geology and Geophysics, hugs a fossilized tree trunk in the Wind River Basin. Currano recently received an NSF CAREER Award. Ellen Currano works in a field in which women are traditionally underrepresented, but with the help of a recent grant award, she hopes to portray that it is a suitable job for a woman. Currano, a paleobotantist, has a geology background. She received a B.S. in geophysical sciences and an A.B. in biological sciences, both from the University of Chicago, and a Ph.D. in geosciences from Pennsylvania State University. She says that the research she conducts is crosscutting between both of her UW departments. Currano digs up fossilized plants; uses them to figure out what climate, ecology and vegetation structure were like; and looks at bug bites on the leaves and interprets insect-plant interactions. Before her UW appointment, Currano was an assistant professor of geology and environmental earth sciences at Miami University since 2009. Although this is Currano’s first semester at UW, it is not her first experience working in Wyoming. She has been researching fossil sites in the state for almost 15 years. People from outside of Wyoming, for the most part, have studied the state’s incredible plant fossil record, Currano says. There hasn’t been someone like her who studies macroscopic plant fossils here in the state, she says. “It’s pretty amazing that I’m the first one here doing that. I think it’s really good for the state to have someone here at this university working on the fossil resources in the state,” Currano says. The time period Currano will study is about 50 million years ago, a time in history when the climate was hot. She and a team of students will travel to various fossil sites in the Wind River and Hanna basins of Wyoming and northern Colorado, tie together sites of the same age, and look at how forests work during warm intervals across a larger region. A Ph.D. student will study modern forests in Massachusetts, Maryland, Costa Rica and Panama in order to better understand the data from the fossil record. Currano’s research focuses on how a warm Earth works. She studies the effects of climate change on plants and the insects that feed on them. She notes biotic diversity and sees how resilient species are to changes. “If we continue to burn fossil fuels at the rate that we’re doing, today, we’re going to set ourselves on a trajectory that Earth hasn’t seen since 50 million years ago,” Currano says. She recognizes that this is not a perfect analog for what is happening today, because the warming 50 million years ago was over geologic time scales. Larger warming intervals took place during millions of years versus hundreds of years. Her work has potential agricultural implications. Currano has observed that, as the temperature gets warmer, more types of insects feed on the plants. As carbon dioxide levels increase, the area of the leaves that insects chew also increases. “If the leaves are getting damaged, that’s decreasing plant fitness and decreasing the amount of nutrition that we could be getting out of the leaves,” she says. During the summer months, Currano and students will collect plant fossils in the field and perform preliminary identifications, as they cannot bring everything back to the lab. Following the summer fieldwork, they will spend the rest of the year in the lab, in which they will carefully identify the types of plants they have collected; look at plant diversity from the different sites; examine bug bites on the leaves; and design climate reconstructions. Some of the plant fossils that Currano’s team collects may go on display in the UW Geological Museum. According to the NSF website, the CAREER Program is a foundation-wide activity that offers the organization’s most prestigious awards in support of junior faculty who exemplify the role of teacher-scholars through outstanding research, excellent education and the integration of education and research within the context of their organizations’ missions. Only assistant professors without tenure are eligible. NSF’s Division of Earth Sciences recommended Currano for the award. “The NSF CAREER Award is total validation of what I’m doing,” Currano says. “It shows that you are in the big leagues now since there are so few awarded.” Currano joins fellow geology faculty members Mark Clementz and Bryan Shuman as recent recipients of the prestigious award. The five-year grant will cover the salaries for a postdoctoral fellow and a Ph.D. student, and it will allow for two paid internships each summer for four summers for undergraduate students. Currano says she is excited about having funding for undergraduate salaries. As part of the CAREER Award, recipients must include an educational component. Currano plans to continue some projects that she started before her employment at UW that highlight the work of inspirational female geoscientists. Paleontology and the STEM sciences, in general, tend to be male-dominated professions. As a means to cope with some of her frustrations of being among a few women in the field, Currano started the blog “An Unsuitable Job for a Woman” about six months ago. The purpose of the blog is to showcase prominent female geoscientists and the work they do. Currano and her students will continue to profile women in the geosciences and will blog about their own time in the field. Currano and a friend were musing one day about the idea of Currano wearing a beard the next time she was in the field and taking a picture so that maybe she would be taken more seriously by some of her male counterparts. The friend, a film director, later presented the idea to Currano of enlisting the help of a photographer friend to create a documentary. They would put beards on prominent female geoscientists conducting research in the field. This creative concept may make people wonder about what a scientist is supposed to look like, and if they can take these women seriously, now that they are wearing beards, Currano says. “The Bearded Lady Project” also includes a touring portrait series. Currano and four other female scientists donned beards this summer for old-style, historical portraits in the Hanna Basin. The portraits are reminiscent of black-and-white photos of field geologists or paleontologists, typically bearded men. More bearded female scientists will be photographed during the grant period. Currano anticipates the opening exhibition of the portrait series will be in fall 2016 in Denver to coincide with the Geological Society of America’s annual meeting. The UW Geological Museum also will host the series, which will be open to the public. Currano expects that the documentary film will be released in 2017. Proceeds from the portrait and film sales will support scholarships for female graduate students in paleontology. To follow Currano’s blog, go to http://www.ellencurrano.me. For more information about “The Bearded Lady Project,” visit http://thebeardedladyproject.com, follow on Facebook at https://www.facebook.com/beardedladyproj or follow on Twitter @beardedladyproj.